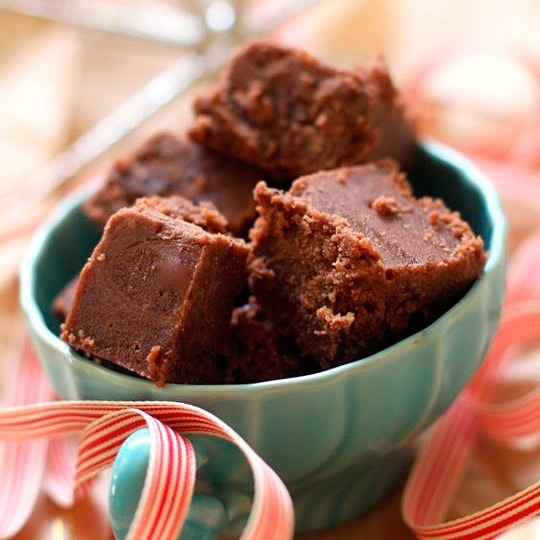 One of my mother’s favorites to make for Christmas was chocolate fudge. Along with her Christmas cookies, of course. And she made it every year. It was devoured within a few days. There’s just something about that smooth, chocolatey sweetness that just screams Christmas! Especially if you add a few shopped candy canes on top of it for decoration. My mother didn’t do that, but if I’m going to cook, I have to put my own touch on whatever I make. I remember my mom standing in the kitchen, patiently stirring and testing the consistency to make sure it didn’t get grainy or scalded. There is a trick to good fudge making, you know. And with the recipes I have, you really need to use a candy thermometer. And you also have to remember NOT to try to taste the chocolate mixture as you’re putting it in the pan, because it’s hot and will DEFINITELY burn your mouth! No, I didn’t try it, but just don’t ask who did….. So I’m happy to share my mother’s fudge recipe with you, as well as a couple others that you may want to try. Yes, you can buy fudge already made, cut apart, and boxed, but this time of year, there’s just something about making real homemade candy and cookies. Even for someone like me who doesn’t really cook that much! So here is my mother’s fudge recipe. Feel free to try it, and see how you like it! Combine ingredients and cook on low-medium heat until it reaches soft ball stage. Use a candy thermometer unless you want to drip a little bit of candy in a cup of cold water to see if it forms a soft ball. Personally, to be safe, use the candy thermometer! Remove mixture from heat and stir in 2 tsp of vanilla. Cool for 25 minutes, then beat with a large spoon (not electric mixer) until it thickens. Spread into lightly buttered 8x8x2 glass baking pan. Let cool, and then cut into squares. Mom always made two batches; one with nuts, and one without, since I’m not a fan of nuts in cookies or fudge. Try it whatever way you like! I’ve also included two other recipes here that I’m going to make this year. Please note they are not original creations, and the creators are noted. Please also feel free to visit their websites for more yummy creations! Line a 13×9″ pan with foil; grease foil with butter. In another large microwave safe bowl, me; remaining white baking chips and shortening. Stir until smooth. Beat in cream cheese and extracts. Gradually beat in remaining confectioners sugar until smooth. 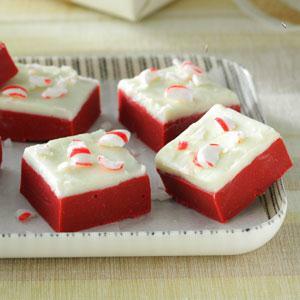 Spread over red layer; sprinkle with crushed candies. Refrigerate 2 hours or until firm. Using foil, lift fudge out of pan. 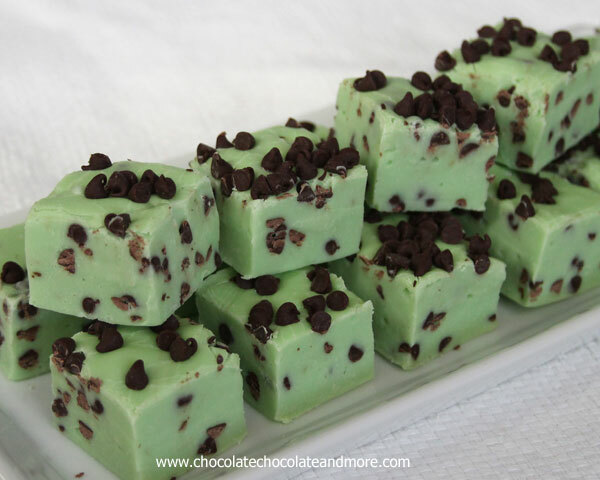 Remove foil; cut fudge into 1” squares. Store between layers of waxed paper in an airtight container. Visit Taste of Home for more recipes! Line an 8x8x2″ pan with foil and lightly spray with cooking spray. Set aside. In a microwave safe bowl, microwave white chips and butter on high for 60 seconds. Let rest one minute and check to see if melted. If needed, microwave further at 15 second intervals. Stir until all lumps are gone. Stir in milk, and extract. Add food coloring to desired color. Let cool for a few minutes and fold in ½ c mini chocolate chips. Press fudge into prepared pan. Sprinkle remaining mini chocolate chips on top and gently press into fudge. Refrigerate a minimum of 2 hours to set before cutting into squares. Store between layers of waxed paper in an airtight container. Visit Chocolate, Chocolate and More© to view this recipe and more! So are you ready for holiday candy making? Let the fun begin! Next What’s So Special About Christmas Cookies?